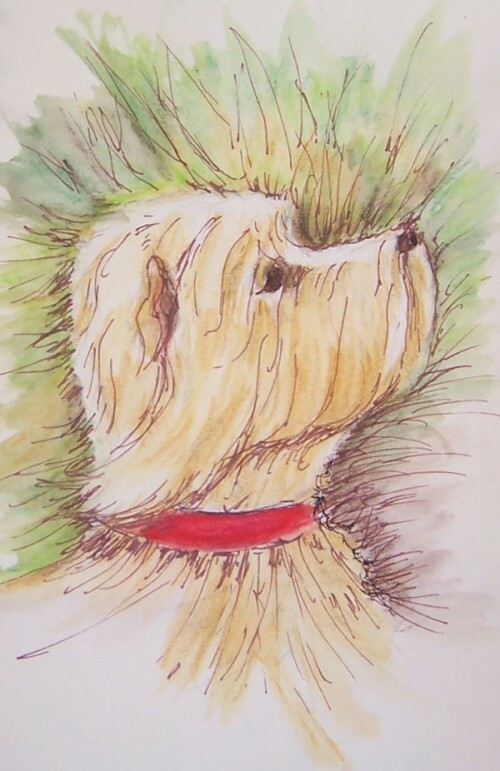 This entry was posted on Monday, July 2nd, 2012 at 12:31 pm	and is filed under Animals, Color, dogs, Paintings, Sketches, Watercolor. You can follow any responses to this entry through the RSS 2.0 feed. You can leave a response, or trackback from your own site. that was a GREAT exercise. Interesting to read about the color disparity and the need for testing first. Thanks, Thom. I admit, I was startled when I picked up a brown pencil and the color after adding water, the color was very red. You can see that on the path in the landscape. The grass shadows were done with a brown-looking pencil……not so. And the red, came out very pinkish. Inktense has gotten a lot of promotion when it came out, so I was surprised by the color problems. it’s interesting to see a subject done two different ways. The dog in the first picture looks soft to touch, but the second one looks more like a wire haired dog. A simple change in medium makes such a diff in content! What a cutie. I love his eyes. I agree with what Leila says. 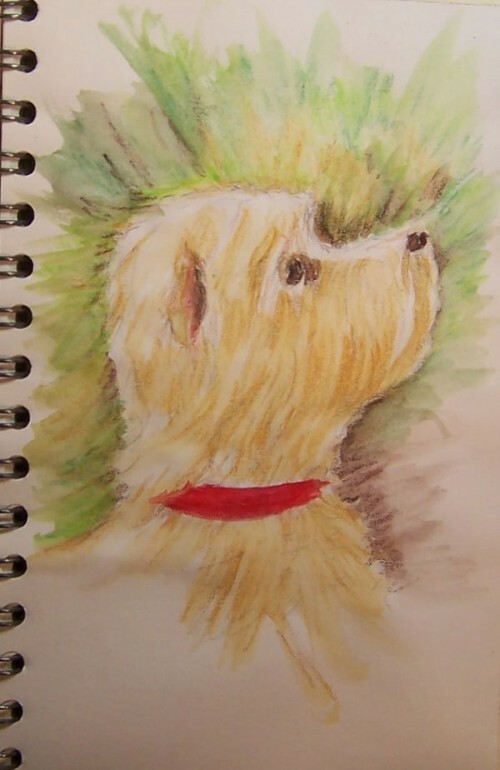 And I say it every time, but I love it when you do drawings of animals! I think that you have a special talent for animals, because, no matter what media you use, you capture their special expressions. Thank you Susy! I was raised with dogs, cats, rabbits and chickens in the country and I had two friends with horses, so I must admit I definitely have a leaning in that direction. I started drawing horses when I was nine years old. I’m more partial to dogs and cats today, but now it’s whatever comes up. I just realized that I haven’t painted a bird in ages. Maybe I should spread my wings.